It feels like these pattern releases are coming more and more often, and fewer and fewer are knocking my socks off - which is probably a good thing. 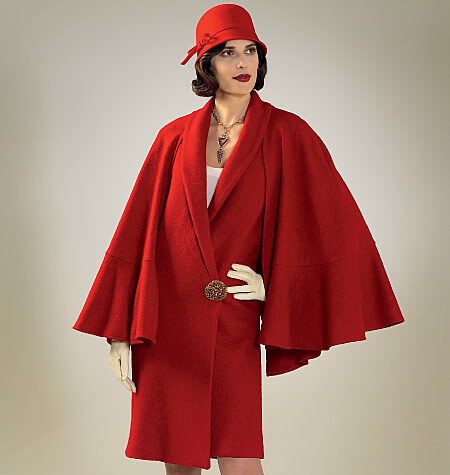 I love that the vintage reproductions are branching out from the standard mid-century silhouettes - the cape on this coat is wonderful! But in reality, the garment is probably not very practical for my life. In theory, I love the idea of a wardrobe full of easy-to-wear flapper frocks, but these particular designs do not look to be very flattering for the wide of hip. 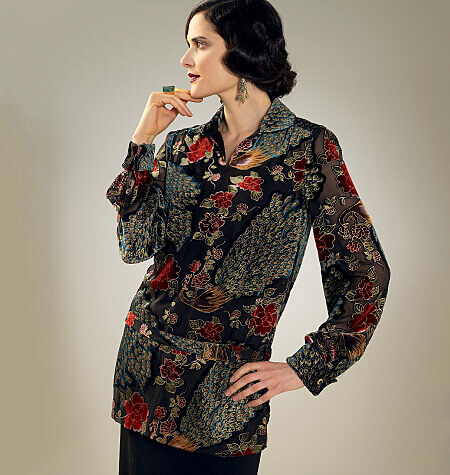 And this blouse is a real fabric hog, although I would not mind getting my hands on some of that cut velvet . . . yummy! Perhaps I need to find a design with some asymmetrical detailing. I really like something about McCall 7243 – if I ever get over my fear of sewing with knits, I may have to try this one. It is difficult for me to resist a fabulous collar treatment. And speaking of knits, I am also drawn to this Tracy Reese Plenty design. But what on earth is the model trying to tell us? Ooh, but what about 7256? Or you already made a coat like that, I think? There's a brocade jacket from a TV show I've been meaning to reproduce, and the shorter version of that looks like a perfect jumping-off point. I, on the other hand, would wear the heck out of that cape/coat! Thank you for all your new pattern posts, even when they don't have anything that excites you. I love keeping up to date now thanks to you! I love 7243 and might give that one so try, though there could be some pulling with the size of the collar in a knit! As for the others I think they do look like costumes, I just can't imagine much of a market. To me 50s (and 40s) are completely wearable day to day, but not 20s. OMG that first two is just amazing!!! I really want that pattern now! !